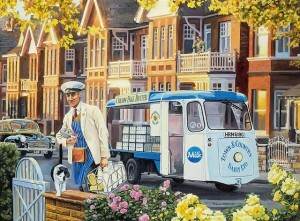 On this day in May 1960 a change was being made in how we received our milk. Since the late 19th century milk had always been delivered to the door, first by horse and cart and later by electronic float. 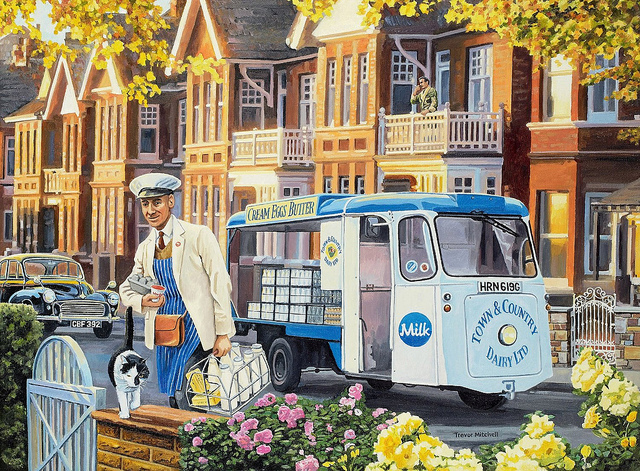 Before the invention of the refrigerator it was delivered daily in an attempt to keep the milk fresh and over time the Milkman became intrinsic to daily British life. Up until this time milk had been delivered in glass bottles each morning across the UK but now for the first time milk was to be packaged in cartons. Initially cartons had only been supplied to schools and factory workers but from June 1960 Lord Rayleigh’s Farms at Hatfield near Chelmsford, then the largest supplier of milk in the country would be replacing bottles for cartons on several doorsteps in Essex. Managing Director Charles Strut stated that each disposable carton cost just over a halfpenny, far more expensive to produce than a bottle but remarks that when you factor in the cost of collection, washing and transport the carton is an attractive choice. One of the objections against cartoned milk has been that the waxen paper affects the taste. These cartons are lined with polythene and give no taste. In reality this objection regards taste continued well into the next century with some people even today preferring glass bottled milk although admittedly they are now in the minority.